"Turns out beautifully and I usually serve this with melon balls or wedges drizzled with honey!" Preheat broiler. Separate eggs and beat yolks lightly. Add salt, mustard, black pepper, and cayenne pepper, and beat until thick and pale color. Stir in Cheddar cheese. In a separate bowl, beat egg whites until soft peaks form; fold into cheese mixture. Arrange bread slices on baking sheet and toast one side in broiler. Remove from broiler, turn bread slices, and butter untoasted side. Arrange bread slices close together on baking sheet. 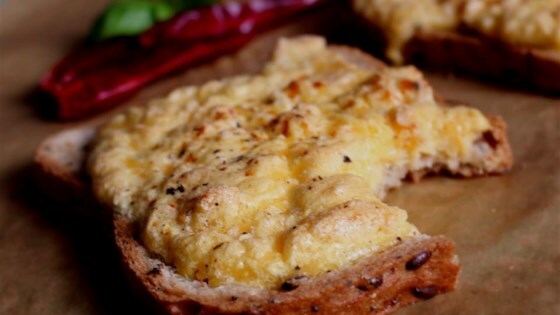 Spoon the egg-cheese mixture evenly over bread slices. Bake 10 to 12 minutes in 350 degrees, or until puffed and golden. Serve immediately. Get delicious cheesy flavor throughout Chef John's light-textured biscuits. I made this recipe last night for my daughter (11) and I. It was quick and didnt taste too bad, but it was very bland. I probably wont make it again. A lot of "fuss" with very poor results. Was not one that I would do again. Sorry. I thought, since the main complaint was blandness, I could make this work. But it wasn't good, nor beautiful. Mostly weird.